We are in the south west corner of the intersection of Loop 360 and Westlake Dr. in the San Clemente shopping center. We join Jack Allen Kitchen, The Woodhouse Day Spa and Wild Orchid Salon in this exciting shopping area in Westlake. 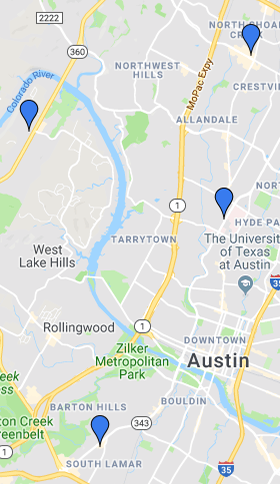 If you are looking for west Austin dry cleaners, look no further! Residents of Westlake have been asking, “why aren’t there any green dry cleaners near me?” Ask no more. EcoClean has arrived. Friday – Saturday drop-offs are ready by the following Monday at 5pm, upon request. No extra charge. Just give us a heads up. Otherwise items are available the following Tuesday. EcoClean won “Best Dry Cleaners” in Austin in 2016, 2015, 2013, 2012, 2009 & 2006. Thanks, Austin!